Andrzej Wajda. Official Website of Polish movie director - Films - "Nasstasya"
This film was born of a theatrical production of Nastassya Filipovna, first staged in 1977 at the Stary Teatr in Cracow. I based my adaptation on the last chapter of Fyodor Dostoyevski's The Idiot, in which Prince Mishkin and Rogozin return to the past in a conversation over the dead body of Nastasja. For years I was tormented by apprehension, and later, by certainty that there exists some better solution for a stage version of The Idiot. Finally chance came to my aid. When in 1981 I visited Kyoto, I saw a performance of La Dame aux Cam�lias. In this way I met Tamasaburo Bando, one of the greatest Japanese performers of female roles. Tamasaburo Bando is an unusual figure. He began his career at the age of six as a student of Kanya Morita in the Kabuki theatre. He was exceptionally quick in gaining the necessary skills to appear as onnagata - sometimes also called oyama - a performer of female roles. Today, Tamasaburo Bando is regarded as the most outstanding onnagata in Japanese theatre. The scale of his talent, however, goes far beyond the bounds of traditional Kabuki: he also plays roles belonging to classical European repertoire such as Lady Macbeth, Desdemona, Medea, Juliet, and La Dame aux Camélias, which I saw during my stay in Kyoto. I had no difficulty to view him as my ideal Nastassya. Strangely, I also thought at the time that this young man would also be an excellent choice for Mishkin. Thus, the audience was able to witness the miraculous transformation of a man into a woman, and so experience the deep mysterious mental link between Mishkin and Nastasja. The theatrical production of Nastassya was, in its way, an event, so it is not surprising that it met with such interest. Unfortunately, after several performances in Tokyo and Osaka, it had to close due to the actor's other obligations. Then I had the idea to make it into a film, which would record our show and at the same time give us a chance to present it to a wider audience. 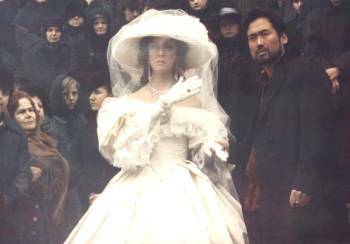 Tamasaburo played the film rich in the experience, gained from almost a hundred performances of Nastasja. In the presence of the camera, his acting became detached and exceptionally film-like - particularly in the interpretation of the character of Mishkin. The female parts created by Tamasaburo Bando are especially dear to me because of the idealisation of women, also present in our Polish tradition. This is exactly how he views Nastassya, revealing everything about her, making her worthy of the love of both men (Mishkin and Rogozin). What's more, he has been able able to inspire admiration even for her faults. The creation of this amazing artist is not a female type, but rather an image of eternal femininity born of masculine admiration, never an act of imitation or mimicry. It is this creative form which is for us as Europeans the most striking feature of Japanese art.